Commission of Inquiry—Bhupinder Singh Hooda case—Grant of commercial license for development of land—Commission did not issued mandatory notice under section 8-B of the Act—Report held to be null and void. Commission of Inquiry—Opportunity of being heard—Wherever the conclusion of the report effects the reputation of a delinquent person, the said person is mandatorily required to be served with notice under S.8-B—Non serving of such notice would make the report of commission null and void. Comments Off on Commission of Inquiry—Bhupinder Singh Hooda case—Grant of commercial license for development of land—Commission did not issued mandatory notice under section 8-B of the Act—Report held to be null and void. Commission of Inquiry—Opportunity of being heard—Wherever the conclusion of the report effects the reputation of a delinquent person, the said person is mandatorily required to be served with notice under S.8-B—Non serving of such notice would make the report of commission null and void. Medical Treatment—Financial Assistance by State—Direction issued to PGIMER to consider the application of the eligible candidates/patients Immediately on its receipt so that they may not have to rush to the Court for release of grant for treatment of life threatening diseases. Comments Off on Medical Treatment—Financial Assistance by State—Direction issued to PGIMER to consider the application of the eligible candidates/patients Immediately on its receipt so that they may not have to rush to the Court for release of grant for treatment of life threatening diseases. IMP ::: Liquor Sale—Excise Policy—Directions issued to States of Punjab and Haryana to make it obligatory for the liquor vends to issue computerised Invoices for all the retail sales irrespective of amount effected by them from their vends. Judicial Review—Policy Decision—When any State policy which is contrary to public interest or is violative of the constitutional principles, it is the duty of the court to exercise its jurisdiction and reject the stock plea that the scope of judicial review should not be exceeded beyond the recognised parameters. Comments Off on IMP ::: Liquor Sale—Excise Policy—Directions issued to States of Punjab and Haryana to make it obligatory for the liquor vends to issue computerised Invoices for all the retail sales irrespective of amount effected by them from their vends. Judicial Review—Policy Decision—When any State policy which is contrary to public interest or is violative of the constitutional principles, it is the duty of the court to exercise its jurisdiction and reject the stock plea that the scope of judicial review should not be exceeded beyond the recognised parameters. Investigation—Inordinate delay in investigation may be taken as presumptive proof of prejudice particularly when accused is in custody so that prosecution does not become persecution. Comments Off on Investigation—Inordinate delay in investigation may be taken as presumptive proof of prejudice particularly when accused is in custody so that prosecution does not become persecution. V IMP::: Summoning of Record—By an appellate or revisional courts— (i) Trial court may send the Photo copy /scanned copy of the record and retain the original so that proceedings are not held up: (ii) In cases where specifically 2 original record is required by holding that photocopy will not serve the purpose, the appellate/revisional court may call for the record only for perusal and the same he returned while keeping a photocopy/scanned copy of the same. Comments Off on V IMP::: Summoning of Record—By an appellate or revisional courts— (i) Trial court may send the Photo copy /scanned copy of the record and retain the original so that proceedings are not held up: (ii) In cases where specifically 2 original record is required by holding that photocopy will not serve the purpose, the appellate/revisional court may call for the record only for perusal and the same he returned while keeping a photocopy/scanned copy of the same. Writ Petition—Locus Standi—Rights under Article 226 of Constitution can be enforced only by an aggrieved person—However, in exceptional circumstances, court can grant the permission to third party to espouse the cause of real aggrieved person(s). Comments Off on Writ Petition—Locus Standi—Rights under Article 226 of Constitution can be enforced only by an aggrieved person—However, in exceptional circumstances, court can grant the permission to third party to espouse the cause of real aggrieved person(s). Maintainability of Public Interest Litigation Rules, 2010—Locus standi to file PIL–NGO filing a petition in the nature of public interest is liable to show (1) Its status and its constitution; (2) it is liable to disclose whether it has been authorized to file such a litigation, and if so, by whom; (3) whether it has the funds to indulge in such a litigation and (4) whether it has the backing of a majority of its members for such a litigation. Comments Off on Maintainability of Public Interest Litigation Rules, 2010—Locus standi to file PIL–NGO filing a petition in the nature of public interest is liable to show (1) Its status and its constitution; (2) it is liable to disclose whether it has been authorized to file such a litigation, and if so, by whom; (3) whether it has the funds to indulge in such a litigation and (4) whether it has the backing of a majority of its members for such a litigation. 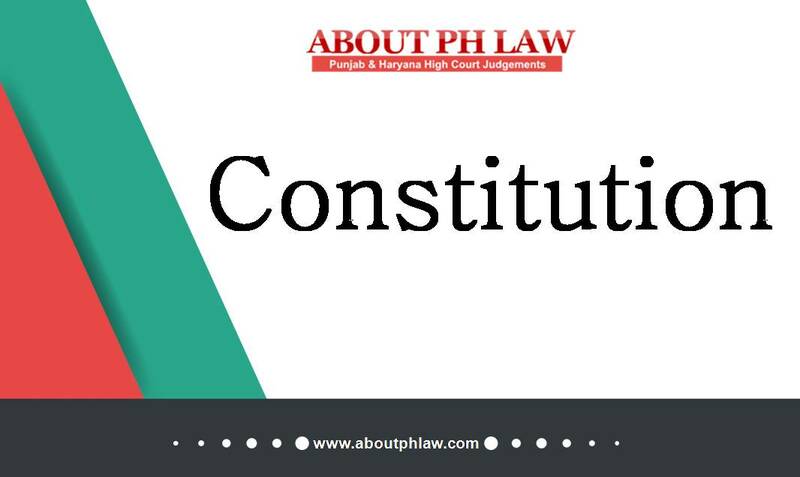 Constitution of India, 1950 – Article 20(1), Article 20(2), Article 20(3), Article 20, Article 226Criminal Procedure Code, 1973 (CrPC) – Section 403(1) Show cause Notice—It is not permissible for a second show cause notice to be issued in respect of the same offences based on the Identical facts and proposing the same penal/punitive action as in earlier show cause notice. Comments Off on Constitution of India, 1950 – Article 20(1), Article 20(2), Article 20(3), Article 20, Article 226Criminal Procedure Code, 1973 (CrPC) – Section 403(1) Show cause Notice—It is not permissible for a second show cause notice to be issued in respect of the same offences based on the Identical facts and proposing the same penal/punitive action as in earlier show cause notice. Writ Jurisdiction—Arbitration clause is not a bar for invoking the writ jurisdiction when apparently injustice is caused and rule of law is violated. Comments Off on Writ Jurisdiction—Arbitration clause is not a bar for invoking the writ jurisdiction when apparently injustice is caused and rule of law is violated. Public Nuisance—Municipal Authorities are under a statutory duty and obligation to remove the garbage from the city. Comments Off on Public Nuisance—Municipal Authorities are under a statutory duty and obligation to remove the garbage from the city. NRI Commission—Commission merely makes a recommendation to the Government and entails no mandate. Comments Off on NRI Commission—Commission merely makes a recommendation to the Government and entails no mandate.